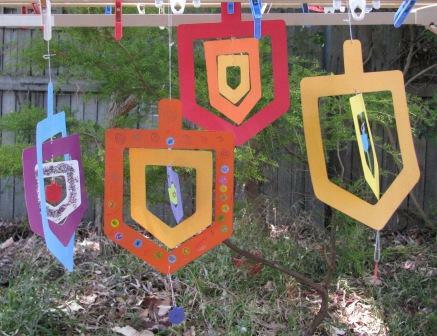 The design for these fabulous mobiles comes from Sara Rivka at Creative Jewish Mom. She sells an electronic “kit” via her Etsy store which I purchased. The kit allows you to print off coloured dreidel shapes onto white paper (allowing you to glue glitter all over the back of the dreidels, for example) or print an outline onto coloured paper, which you can then either leave blank or decorate any way you like. All you need to do then is cut them out and connect them to each other with a little bit of thread. And in case anyone is wondering why I’m still posting about Hanukkah nearly a week after it finished… it’s because Hanukkah is unofficially running at our house until the end of December! 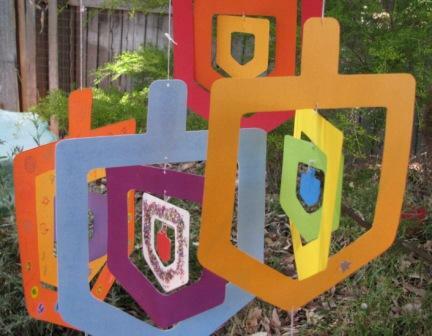 8 Responses to "Dreidel Mobiles"
Just saw this three years later, looks great! Maybe I’ll see if readers are interested this year, hope it’s okay if I use a photo or two, I’ll link back to you, thanks! You are very welcome! I have a bunch of them up in my home at the moment and we love them! The first ones I made I just tied string to the top and bottom of each one, but that was quite fiddly. A second batch (not shown here, I made them from multi-coloured cardboard a year or two later) I decided it would be easier to just put one thread through the entire dreidel, and sticky-tape it into place on each segment. Both work fine.